How to represent a graph of linear equation in two variables? Linear equation in two variables is represented graphically by the line whose points give the collection of solutions of the equation. This is called graphing linear equation. 1. Linear equations have infinitely many solutions. 2. Every point (h, k) on the line AB gives the solution x = h and y = k.
3. Every point which lies on AB satisfies the equation of AB. 4. To draw an exact line on the graph paper you can plot as many points you like, but it is necessary to plot minimum three points. 1. Convert the given equation in the form of y = mx + b (slope intercept form). 2. Apply trial and error method to find 3 pairs of values of (x, y) which satisfy the given equation. 3. Plot these points on the graph paper. 4. 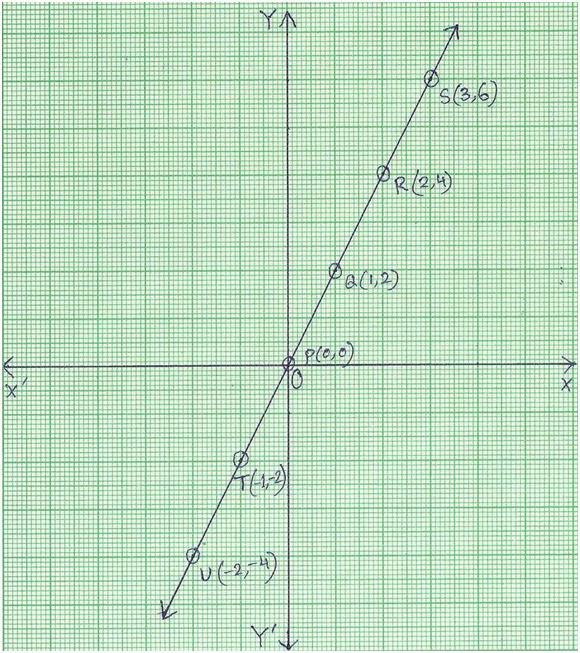 Join the points marked on the graph paper to get a straight line which represent the given equation graphically. 1. Linear equation in two variables has infinitely many solutions. 2. A graph of linear equation is always a straight line. 3. Every point on the straight line is the solution of the linear equation. 4. Equation of y-axis is x = 0. The standard form of this equation is x + 0.y = 0. 5. Equation of x-axis is y = 0. The standard form of this equation is 0.x + y = 0. 7. y = b is a graph of straight line parallel to x-axis and standard form of this equation is 0.x + y = b. 8. The equation y = mx is always passing through the origin (0, 0). 1. Draw the graph of the linear equation y = 2x. The given linear equation y = 2x is already in the form of y = mx + b [here b = 0]. Now we will apply the trial and error method to find 3 pairs of values of (x, y) which satisfy the given equation y = 2x. Arrange the values of the linear equation y = 2x in the table. Now, plot the points P (0, 0), Q (1, 2), R (2, 4), S (3, 6), T (-1, -2), U (-2, -4) on the graph paper. Join the points of P, Q, R, S, T and U. We get a straight line passing through origin. This straight line is the graph of the equation y = 2x. 2. Draw the graph of the equation 4x - y = 3. The given linear equation 4x - y = 3. Now we will apply the trial and error method to find 3 pairs of values of (x, y) which satisfy the given equation y = 4x - 3. Arrange these value of the linear equation y = 4x - 3 in the table. Now, plot the point P (0, -3), Q (1, 1), R(2, 5) on the graph. Join the points of P, Q and R.
We get a straight line passing through origin. 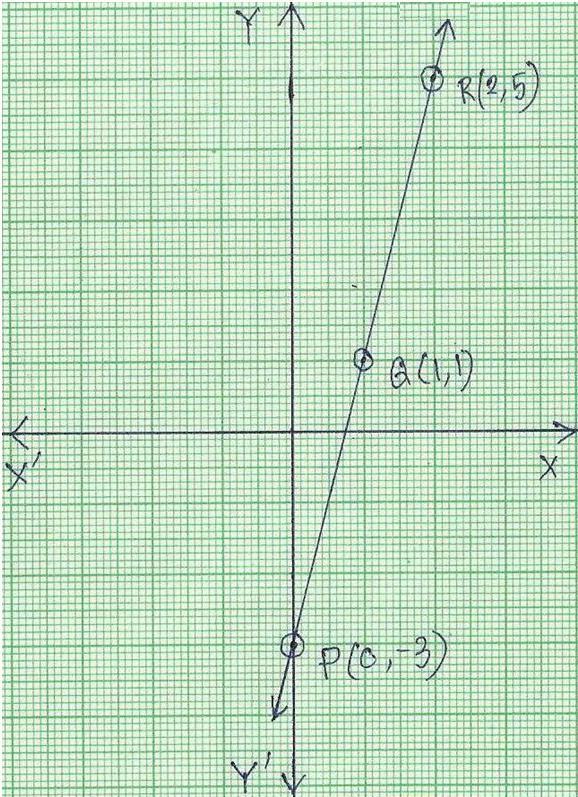 This straight line is the graph of linear equation 4x - y = 3.